Essentra Packaging has reinforced its global influence by winning three more prestigious awards. 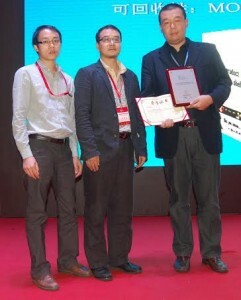 The Company was honoured with a second consecutive Asian Manufacturing Award, this time in the Innovative Food/Beverage Packaging Design category, which was then followed by a Sustainable Package Technical Award from the 4th China Package Technology Innovation and Sustainable Development Forum. The key advantage of Essentra’s wide-width message tape is that when a promotion changes, the manufacturer can simply change the message on the tape without redesigning the entire pack. This saves money by reducing waste and origination fees as well as minimising packaging waste. The colourful design possibilities on the message tape also boost on-shelf presence and influence the decision making of buyers at the point of purchase. Essentra also celebrated a Sustainable Package Technical Award from the 4th China Package Technology Innovation and Sustainable Development Forum. The award was presented for the RippatapeTM product for use on corrugated and fibreboard cartons. Designed primarily for easy opening, Rippatape also increases the compression strength of secondary packaging, reducing the product damage that can occur during transit. This means producers of fibreboard and corrugated secondary packaging can potentially use thinner board, delivering cost and environmental benefits in terms of reduced material consumption and lighter weight. Further, Rippatape does not impede the recycling of the board it is adhered to, as the tape can easily be separated as part of the recycling process – a key benefit of Essentra’s water-based adhesive. Essentra’s award winning year was capped with victory at the UK Packaging Awards 2013, in the Design Team of the Year category. The UK Packaging Awards are the largest and most prestigious in the UK packaging sector, celebrating the best the industry has to offer in terms of business performance, personal achievement and packaging innovation and design. The Design Team of the Year Award was presented during a glittering ceremony at the London Hilton on Park Lane on 13 November. Essentra Packaging is part of the Packaging & Securing Solutions division of Essentra plc. Essentra Packaging is a global provider of packaging products that deliver benefits to consumer and healthcare markets, combining pack functionality with creative design & print to deliver brand communication and protection. Essentra’s ‘Packaging Resolved’ positioning emphasises the four core themes of Opening, Closing, Informing and Protecting – where its cartons, leaflets, foils, tapes, labels and seals can combine to provide all or simply one of these benefits. From helping ensure users do not get frustrated in opening packs through to providing the reassurance that products are fresh and have not been tampered with, Essentra Packaging’s products are an integral part of the product and brand pack experience. Supported by a global manufacturing base, in-house design studio, R&D facilities and multi-million pound print facilities, Essentra Packaging is positioned to deliver the very best in quality, service and reliability to help make our customers and consumers lives easier.